-La Casa debe estar a la venta. -Los Propietarios deben estar dispuestos a que un fotógrafo del New York Times tome fotos de la casa. -La Casa debe estar amoblada. -El valor de la casa puede variar, pero se prefieren casas entre los $700.000 a $5.000.000 US. -The home must be on sale. -The owners must be willing to have a New York Times photographer take photos of their home. -The home must be furnished. Tags: house for sale, Quito, real estate services. For anyone who has questions on passports, local driver’s licenses, Ecuadorian visas, or importing goods, this is the perfect opportunity to get answers to all of your questions. If you are a Canadian citizen, we invite you to register with us. This will allow the Embassy to contact you in case of an emergency. L’Ambassade du Canada est heureuse de vous inviter à une session conjointe d’information avec la collaboration des autorités locales du Ministère des Affaires Étrangères, du Bureau de l’État Civil, de l’Agence de Transit. Si vous avez des questions concernant les passeports Canadiens, les permis de conduire Équatoriens, les visas Équatoriennes ou l’importation de marchandises, c’est l’occasion idéale pour obtenir des réponses. Si vous êtes citoyen(ne) canadien(ne), nous vous invitons à vous inscrire auprès de nous. Ceci nous permettra de vous contacter en cas d’urgence. This video is fresh news locally, it was recently made by the cast of a local TV show… hope you enjoy it and get to know a bit more of Ecuador’s Pacific Coast. 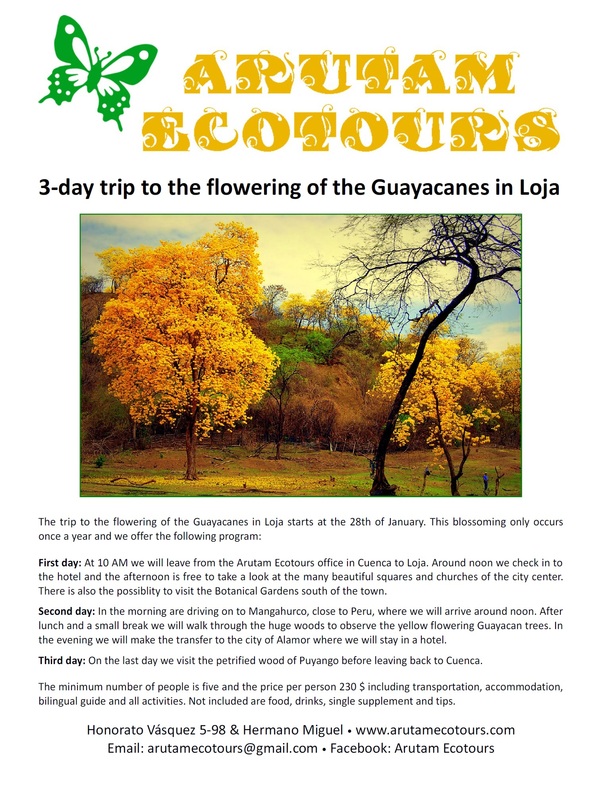 The trip to the flowering of the Guayacanes in Loja starts at the 28th of January. This blossoming only occurs once a year and you can enjoy it by taking a trip with this agency. The information provided here is a FREE publishing service of Ecuador Services, we are not liable or responsible for the accuracy or completeness of any information provided on any other website, blog or service. 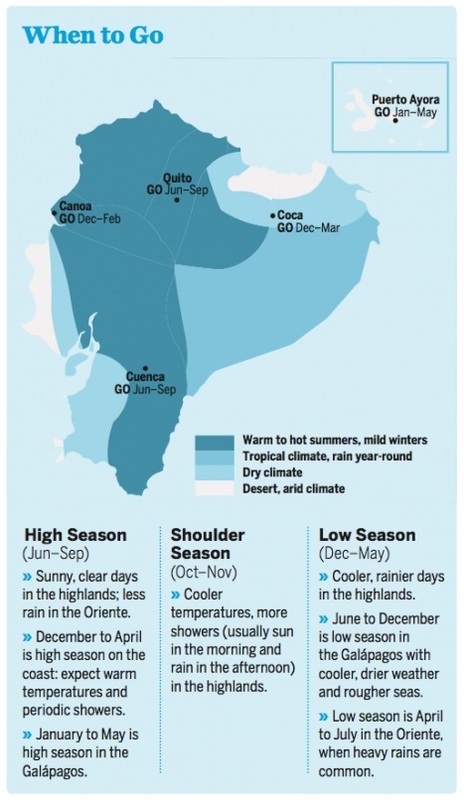 Christmas Day is already gone, so we can start preparing and planning for our 2015 winter vacations… Here is Ecuador Seasonal Map to help you plan on the right time of the year to visit this country. As you will notice it details mainly the seasonal climate changes in the highlands of Ecuador. Now this days most locals say that weather has change a lot, it used to be rainy season between December to May, but in these days, it could rain any time of the year in Quito, Ecuador. If you are visiting the highlands of Ecuador like Quito or Cuenca do bring warm extra clothing for those rainy and cooler days. Cuenca Singles is sponsoring a Social Mixer for Singles in Cuenca. We have had a large number of new people who have become members in the past few months. Our membership is now approaching 200. We welcome all singles to this mixer as a way to meet new single people, network, and make new friends. The mixer will be at Paladar’s Restaurant beginning at 7:00 – 9:00. The $10.00 cover charge covers your first drink and there will be tapas served by strolling waiters during the evening. Reservations are required and should be made at Palaarsdinnerclub.com. Please only make a reservation if you are sure you are coming because food quantities will be planned according to the number of reservations. Music will be available for those who may want to dance and spaces will be available to congregate for those who would just like to socialize. Please contact Bob Higgins with questions. After more than 7 years of living in Ecuador, I can honestly say I have a pretty good grasp on Ecuador’s coastal real estate market. Since I have seen property prices rise at a surprisingly rapid rate, I will like to share a great Real Estate NY Times article that I read today and my personal comments on the topic. My personal opinion is that the information you receive from online sources and printed material about living or retiring in Ecuador is not current with reality. When they mentioned beach properties in Ecuador between $10,000 to $50,000 US, I would say that in rare occasions you could find a local beach property at that price, maybe you will find a property that is in a remote beach area, or in desperate need of repair, or it has some legal problems and title problems. Now Ecuador is a great “beach Paradise”, I honestly could say that is still one of the best Latin America destinations to live and retire; just that you have to be ready to pay a bit more than what is advertised at times. If we compare to other retire heavens along Central and South America, I will say Ecuador can offer you more value to your dollar: Political and Social stability, US dollar currency, beachfront property belongs to you, better weather not as humid or hot, growing economy and very warm and welcoming local people. What you basically have to do to buy at real local Ecuadorian housing price is research the local market, you may have been told that there is no MLS services in Ecuador, but the real truth is that there are plenty of great local MLS services, I know there are in Spanish, but now a days as the industry gets more globalize, I am pretty sure that soon they will be offer different languages platforms. I would recommend doing your homework before getting involve with Real Estate agents or Lawyers in Ecuador, you will find a lot of times that this people are not up to date on prices and surroundings areas news. At times even locals or a person like me with years of local experience on developments can oversea markets tendencies or local governments problems, since it is an emerging economy, a lot of local governments are embracing new laws and changes. This is exactly what happened to Playas just an hour drive from Guayaquil’s airport, it was expected for Playas to be the next beach spot, but Playas has stagnated in time, there has been no improvement on roads and basic services as it was promise, I would say that it has worsen in that past year, and the local Municipality has no mentioned new plans or improvements. I’m sad since it is a great beach location with lots of sunshine all year round, but unless they are able to overcome their local politics, there is not much that it can be done. All of these have push all other beach locations along Coastal Ecuador: Santa Elena to increase on price and demand: Salinas, Punta Blanca, Olon and many more are seeing great construction developments supervise by the local Santa Elena Municipality with great basic services improvements. The housing market in Ecuador, frequently touted as one of the best and cheapest countries worldwide for retirees, has been supercharged for the last five years, with home prices appreciating annually by 10 to 12 percent, Mr. Morrill said. The global real estate crisis of 2008 had no impact on housing prices there, with a large influx of Ecuadoreans returning home helping to maintain a robust market, he said. Foreign home buyers in Ecuador are predominantly North Americans, though there are also Europeans, Australians and New Zealanders, agents said. There is a significant German expatriate community in Cuenca. Most recently, many Canadians have been in the market seeking homes in the coastal areas. There are no restrictions on foreign home buyers in Ecuador. Bank mortgages are extremely difficult to obtain, and while some of the larger property developers offer short-term financing, it’s largely a cash market, brokers said. A lawyer is not necessary to buy a home, but some brokers recommend that non-Spanish-speaking foreign buyers hire one, which typically costs about $850. The most important way foreign home buyers can protect themselves is by purchasing only properties that can be registered at the Real Estate Public Registry, Mr. Uhe said. “When you read about nightmares with home purchases in Ecuador, it’s all relating to properties that are unregisterable,” he said, which frequently has to do with title issues. In general, closing costs range from about 1.5 to 2.5 percent of the purchase price, Mr. Morrill said. Traditionally, buyers pay the real estate agent’s fee in Ecuador, but that is changing in many areas, agents said. In Quito and Cuenca, sellers now pay that fee, which is typically 3 to 5 percent. In Vilcabamba, buyers still pay the broker’s fee most of the time, Mr. Uhe said. Property taxes on this home are less than $500 a year, and the homeowner’s association fee is about $120 a month, Mr. Uhe said. Tags: cheap prices for property in ecuador, coastal ecuador, ecuador properties, Real estate, real estate services. Great event in Guayaquil at the MAC Cinema Malecon 2000 boulevard, -Galápagos 3D, by famous BBC Sir David Attenborough- , sponsored by the British Ambassador Patrick Mulle and the Municipality of Guayaquil, all proceeds will go toward the Charles Darwin Galapagos Foundation for the preservation of the Manglar Pizon. Con el apoyo del Embajador Británico Patrick Mullee y la Muy Ilustre Municipalidad de Guayaquil tengo el honor de invitarlo el lunes 13 de octubre a las 19h00 a participar de la proyección del documental, Galápagos 3D, narrado por el famoso presentador de la BBC, Sir David Attenborough en Cinema Malecón (IMAX). Dada la exclusividad del evento, agradecería confirmar su asistencia y la de su acompañante(s)a la brevedad posible al correo administrativo@camcomeb.com o al teléfono 3703870 ext. 6895-6896. Ecuador Citizenship Law interpretation got updated – October 2014. You may get a second passport and dual nationality for tax, business or other personal reasons. Maybe you enjoy traveling freely in some countries like China, India, Brazil and Bolivia that charge Americans a stiff fee for entry visas. The main requirement is you need to be a resident of Ecuador for a minimum of 3 years from the date in which you get your first “cedula (Ecuador ID card)” or 2 years if you have an Ecuadorian kid. If the resident wants to apply for citizenship he/she cannot leave Ecuador for more than 90 days in total for the first 3 years as Ecuadorian residents. The resident visas in Ecuador will grant you permanent residency. That means you’ll be allowed to come and go from Ecuador as you wish. However, you can’t be absent from the country for more than 90 days per year during the first two years of your residency, nor more than 18 consecutive months after your second year of residency. This previous requirement will only apply to keep your resident visa active, if you are planning to go for dual citizenship and to carry a Passport of Ecuador, you can’t be absent from Ecuador for more than 90 days for the three years. This law has been on the books since 1976, just that the previous Naturalization Department Director have been interpreting the law the wrong way. The Law: To maintain the residency visas: 90 days a year for two years and 18 months for the third year on. Birth certificate apostilled (if from a country from within the apostille treaty like the US) or legalized by an Ecuadorian consulate abroad and then translated. Copy of passport notarized and the original with the current resident visa. Copy of cedula notarized and original. Certificate from both the SRI (Ecuadorian IRS) and the BIESS (Social Security) stating you have no outstanding debts to either, (Certificacion de no ser deudor). Movimiento Migratorio y Record Policial from Local Police. Ecuador income is taxed by the Ecuador government, foreign income consider at all, regardless of if you are a citizen or not.